Domo, the odd-looking mascot for Japanese public television station NHK (and Internet meme in his own right) will be invading 7-Elevens across the US in the form of Slurpee cups. This one goes under "odd cross-promotions" for the week: In a promotion for the US release of the first Domo DVD, the fuzzy open-mouthed mascot will be gracing Slurpee cups and coffee cups found in 7-Eleven stores all across the United States. Domo, who was created by Japanese illustrator and director Tsuneo Goda as the mascot for Japanese public television station NHK in 1998, has become somewhat of an Internet meme thanks to his odd (though adorable) appearance, and... okay, it's mainly just his odd and adorable appearance. Outside of Japan, Domo is perhaps best-known for being the source of grisly kitten death every time somebody whips it out. There's also a three-part episode produced specifically for the promotion (viewable on Domonation and slurpee.com) that features Domo and pals in search of delicious frozen 7-Eleven treats - and finding only brain-frozen trauma. Delicious, brain-frozen trauma. Collectible cups feature Domo and his furry sidekicks enjoying Slurpee drinks and one showing Domo experiencing a Brainfreeze. 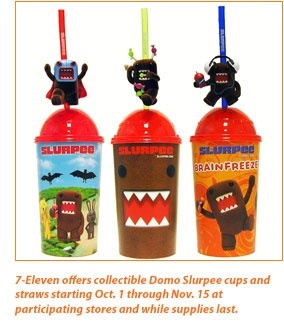 For Domo fans, a tiny flocked Domo character is affixed to premium Slurpee straws, selling for $1.99. From hip hop to wrestling themes, each of the four Slurpee straws features Domo sporting a different costume and accessories. Coffee and Big Bite hot dogs, two of 7-Eleven's best-selling proprietary items, also get 'Domo-nized' as a limited offering through Nov. 15. To reach younger coffee drinkers, 7-Eleven is offering coffee in a special brown Domo cup for just 99 cents. Store signage promoting the coffee deal urges customers to "Obey the Domo." Likewise, the Big Bite hot dog also will retail for 99 cents and be served in a cardboard "clam-shell" carrier resembling Domo's face, with the mouth opening to reveal the food. "You won't be able to go to a 7-Eleven store in October and miss Domo," Wilkins said. "We've let Domo fans know he's coming with notices on Facebook and Twitter, and the online buzz about his 7-Eleven debut has already been building." You can read the full press release here, or check out the limited-edition Fuji Frost Slurpee flavor - complete with Domo cup and straw - at pretty much any 7-Eleven.